Wednesday, December 5th, 2019 -- New soccer fields will be coming to Tucson in early 2020. On Tuesday, the Pima County Board of Supervisors approved, in a 3-2 vote, $9.6 million in funding for the second phase of the Kino South Sports Complex. The new fields will be located just south of the I-10 and just north of Benson Highway. 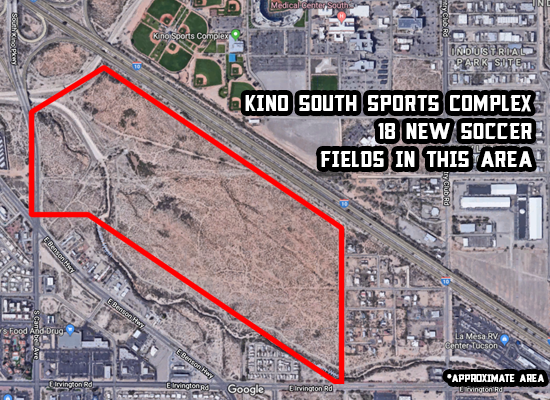 This expansion will see Kino Sports Complex grow from six fields to 18 fields. The first phase of improvements will develop a regional tournament complex with 12 natural grass sand-based multi-use fields, parking, an entrance from Benson Highway, 20 pickleball courts and additional infrastructure, including concessions, lockers and an area for vendors and players. Phase 1 is slated for completion in early 2020.